THE ROMANY LIFE: Hello Utah! 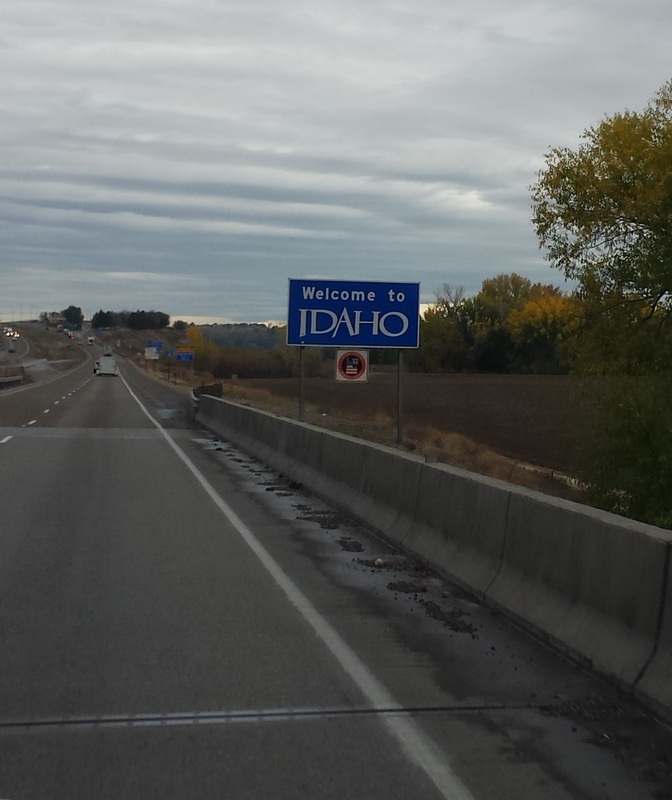 We just traveled today and arrived in Mountain Home, Idaho. It was a given that we would be staying in one of our favorite boondocking spots (or dry camping, depending on your preference, we call it boondocking). It turned out to be a Walmart, and we got settled in with a few other rigs in the rear of the lot and then did some shopping inside. We always need a few things, never fails. On a fairly regular basis, we get comments from other people when we talk about stopping over at a Walmart, or a truck stop or some other spot, that "that doesn't seem very fun". These comments always come from a person who either does not RV much, or if they do, they only go on quick family trips to a destination, like the beach or a campground. This is all very well, and completely normal behavior. We do that too, frequently. We have 4 children who all grew up RVing a LOT, and it is still our favorite mode of recreation, and I think, always will be. When we stay at a non-recreational spot, a Walmart for example, it is NOT for recreation. It is a place to sleep on our way to recreation. Like now, we are on the move. Truck camping is particularly well designed for this type of recreating. We don't go to a campground, park, setup camp, put out chairs, awnings, washer-toss games and all that. We are on an excursion. Sleeping at night is not part of the excursion. It is like when you stay in a hotel. The hotel is usually NOT the destination, rather, it is NEAR your destination. The beauty of this kind of travel is that you never back-track. You see much more, for less money, in less time than in the traditional camp-ground type trip. Those are great when the campground IS the destination, but we are moving always forward, and make a "loop trip" that allows us to see a LOT of places very efficiently. We usually move every single day, and that is not a problem when you have an RV that is road ready in less than 5 minutes. We are like turtles, if you will. You see, the camper looks the same inside when the blinds are drawn for the night. We could be at Yosemite or in a parking lot, it doesn't matter to us, because we are SLEEPING. In the morning we are up early and on the road again, headed for the next adventure, usually a national park or other treasure. We park in the regular parking lot (yes, you can do that too with a truck camper!) and spend the day playing. When it's getting late, most times, we climb in the truck and head for our "sleeping spot" which will be on the way to our next stop, sometimes a campground, sometimes BLM land, sometimes a parking lot, it just doesn't matter. What's the downside? We spend a lot in gas. Fuel, when you drive nearly every day for 2-4 hours, is substantial. But, on this trip, we will have visited 9 states and several national parks and countless other side-trips and attractions. We love traveling this way, it is sort of an "immersion" experience, and it's something we look forward to all year. This morning we left our parking lot sleeping spot and headed east again, toward Utah. We will sleep in Provo tonight and it will be our last "travel day". The fun starts after that as we are then within range of our chosen attractions! We stopped at a very picturesque state park in Idaho simply to dump our tanks and take on fresh water, all for a very fair $5. Now we are good for 3 days on the move! You gotta love it! We had a nice, uneventful travel day today and arrived in Provo as expected. 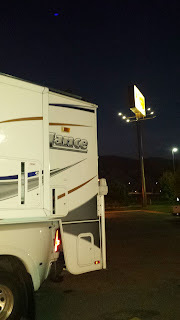 We had consulted our ALL STAYS app and learned that there was a Walmart AND a Cracker Barrel there just off the freeway that would allow us to boondock for the night. We chose Cracker Barrel, because we love them, and we don't have them where we live, so it's a real treat to go there. Since we are "Gluten Free" there unfortunately isn't very much on their menu that we will eat, but their food and their little Country Store are so cool! Breakfast is so good at Cracker Barrel! And while I am at it: A big THANK YOU to all the businesses on the road who offer up their parking lots for us transients. We appreciate that you do this, and we hope others do too. We always patronize your stores and restaurants, and we will always be respectful of the privilege and courtesy you extend to us by making as minimal a presence as we can, and leaving the spot cleaner than when we arrived. Thank you! I know I speak for RVers across the country when I say that it is in great part due to your generosity that we are constantly inspired to HIT THE ROAD and keep on travelling! Before leaving Idaho, I had thrown dinner into my Thermal Pot (LOVE this thing) and so dinner was waiting when we arrived. We had a nice dinner and then decided to take a good long walk to get the travel kinks out. The weather was awesome, which was a nice bonus. Not even a sweatshirt needed. Upon returning, we chose a DVD from a big collection that we always have in the camper and settled in for the night. Tomorrow we hit our first adventure! Capitol Reef National Park! Yay! I get to use my new hiking boots!